We have been educating and entertaining people with our amazing reptiles for over 15 years! We have been featured at venues such as Space Center Houston, as well as large city festivals across the state. For an educational and sensational reptile experience, count on Texas Snakes & More! Our programs are very interactive, and everyone will have a chance to hold/handle/touch all of our friendly, safe and docile animals! There will be a lot of great photo opportunities!! We'll have reptiles from around the world including snakes, lizards and turtles! Kids were excited to hold all of the snakes. Great for a party! Thanks so much! You had a great group of kids! Very hands on, and keeps the crowd very interested! Excellent show. Thank you! It was a great event! Our boys and their friends were entertained for the entire show where they got to look at, hold and pet different types of reptiles including a skink, tortoise and many snakes. The grand finale snake was awesome to say the least. We got some really great pictures. I would highly recommend Texas Snakes & More and I am sure we will have them back for future birthday parties. The children loved the snakes. Great hands on activity for our group. Will book again for next summer. Thank you Linda! We will look forward to seeing y'all again!! Mr. Clint was on time, engaging with the kids, informative, funny, and worked well in a crowd of 275+. the kids and parents had a Great time with his pets. We are so pleased that we got to meet him and is pets. we hope we will get to see him again someday! God Bless! Thank you Dawn! Clint enjoyed your group as well!! We definitely hope to work with you in the future!! Fantastic!! Don't think it is just some snake show for the kids. I had both kids and adults and this was the talk of the entire evening!! He brought in crates of snakes and animals and people were taking pictures and having fun learning about the animals. I was skeptical at first when booking because how fun could a snake show really be?? Yet I am highly highly satisfied I did because this was a huge hit! Book him for your next event - your guests will love the interaction!! Thank you so much! I'm glad everyone had a good time! We couldn't have asked for a better time! The kids and parents had a blast!. My 6yr old woke up the next morning talking about it was the best birthday party ever and his brother slept with his snake he got at the party. I was very informative and interesting. I would recommend "The Snake Man" as my kids would say, for any party or school event. I want to thank Bubba for helping get over my fear of snakes. I hired Texas Snakes & More for my daughter's 7th birthday party. It was fairly priced and they brought a nice variety of reptiles. All of the reptiles are well cared for and friendly,everyone had plenty of time to hold and take pictures with the various reptiles without feeling rushed. It was an awesome party-everyone loved it. Clint and Michelle Pustejovsky are very kind and friendly with a love for their animals and people. Schedule parties with their business with confidence,you will be very happy with their service. 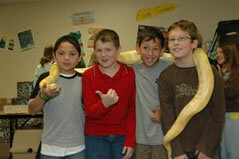 Reptile events by Texas Snakes & More are fun and educational. Our presenters will come to your location, and share their absolute love of snakes and reptiles, why they are important for our environment, and what to do when you spot a snake in its natural habitat. As age groups are different, each show is adjusted (time and information) to fit the appropriate age of the group. The program is completely interactive, with the participants being allowed to hold/handle/touch all the animals we bring. We don't just show an animal, talk about it and put it back up. All the kids get to handle all the animals - they are all very safe and friendly! 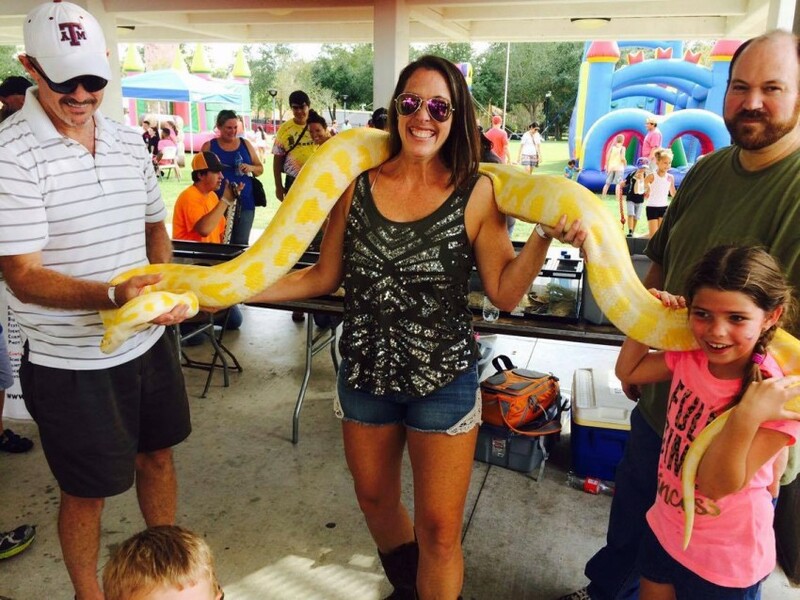 Presenters help both the children and adults with their fears and apprehensions about snakes, and most of the time, people who thought they would never touch a snake touch, hold, get their picture taken, and enjoy learning about these fascinating animals. We bring non-venomous, non-aggressive and safe snakes. We also provide waterless hand sanitizer before and after contact with our pets. The goal is to excite the guests and have fun, so they can laugh and understand that snakes are animals like most others. There's not many things more fun than getting your picture taken with a beautiful snake around your shoulders? 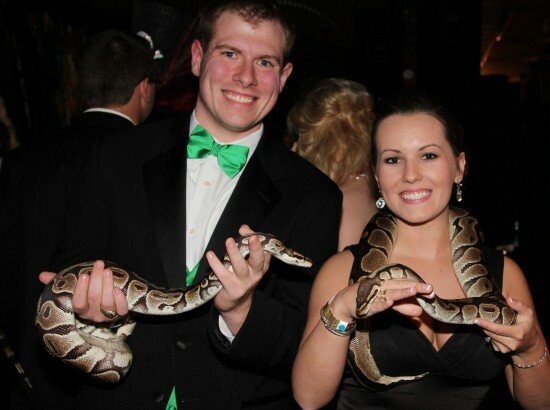 All reptiles brought to each party are personal pets of Mr. Clint "the Snake Man." Tweens and teens love Mr. Clint's snake show - they think it's 'really cool'! Presenters adjust the show for the older kids, and they have a blast! We also perform at many larger events such as festivals and company parties. We can have display tables with native Texas snakes in cages as well as handleable snakes for the guests. 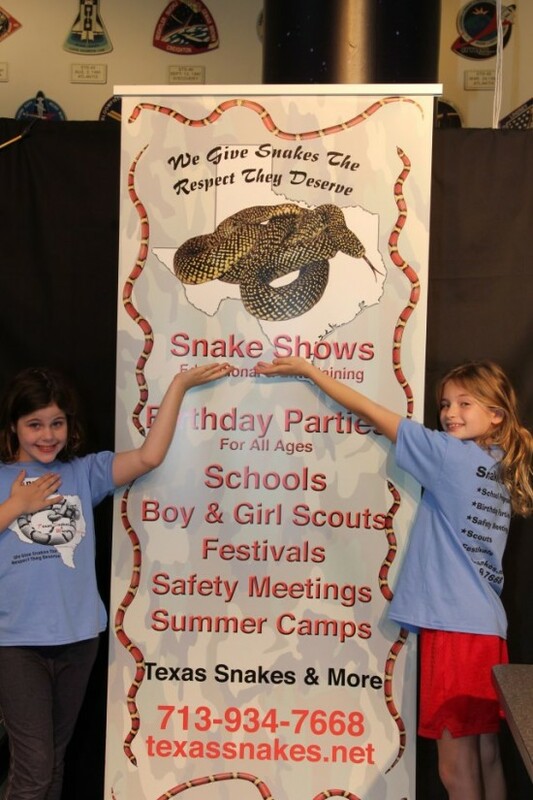 We are snake experts, so we can also talk about venomous snake safety and identification to audiences of all sizes.